When it comes to recent theatrical releases, it's becoming harder to critique their corresponding Blu-rays on a technical level. So much high definition digital work is done, either at the production or post production stages (or both), that by the time a home release rolls around a company has to almost deliberately botch a digital transfer in order to produce an inferior Blu-ray. Consequently, for this reason (among many others) I am most thrilled when exploring a Blu-ray for an older, pre-digital, theatrical release, one in which there is a lot more potential for failure or success based on the application of the various digital cleanup processes. Which is a long, roundabout way of saying that when I receive three Blu-rays from Fox Home Entertainment over the past month, 127 Hours, Black Swan and Love & Other Drugs, I can generally rest assured there's not much to complain about in terms of how they look or sound. So instead, I'm struck by something the three movies themselves have in common. It's the first person narrative mode they all share. Maybe this isn't such a big deal, you may say. Aren't most movies related in this fashion? I haven't really thought about it for quite a while. Certainly, as a formalist, I would guess that within the last 30 years as structure and form have become more important to filmmakers in general, there's been a rise in the use of first person. (In the past, it was often confined to film noir, for instance.) But since I've been doing my video column for Wide Screen, and because it's that time of year when finding a good theatrical release is rare, I've been immersed in older, classical (not just classic) style films. While she pirouettes her way through practice, DP Matthew Libatique whirls the camera exhiliratingly, sweeping us away and allowing us to experience the allure this painfully exacting art form holds for our heroine. Other times, we are allowed to see the obsession creeping into Portman's manic behavior, as the physical and mental demands of her rise to stardom start manifesting themselves in bizarre scars on her back which hint at a history of cutting. This obsession gives way to a variety of hallucinatory images which mark Nina's perspective as both unreliable and distinctly interior. It addresses complaints I heard from many of Black Swan's detractors: the story is inconsistent; how can Nina dance with a deep gut-wound; Portman/Nina can't even dance that well (the most bizarre of the complaints which has reared its head again recently; none of the featurettes on the disc hide Portman's lack of ability or the fact she used a double). Such nitpickers miss the point. For all one knows, all of Black Swan could simply be one infantile wannabe's protracted fever dream about being a successful ballerina. 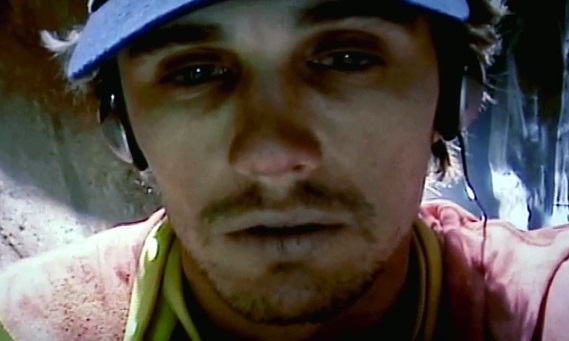 Aron Ralston (James Franco), the extreme hiker from Danny Boyle's 127 Hours (2010), is an unreliable narrator of a different sort. Unlike Black Swan's heroine, whose credibility is so suspect one wonders about the very reality she experiences, Ralston's viewpoint is disturbed by external events, not internal, arising from a horrifying predicament. Ralston is literally stuck between a rock and a hard place. After falling through a crevasse in the Utah desert, his arm is trapped behind a boulder. As time passes, loneliness and desperation begin affecting his mental state, manifesting itself in realistic flashbacks where Ralston recalls the joys of social interaction in large groups, the intimacy of a past relationship, and dreams of rescue. Director Boyle smoothly shifts between Ralston's interior monologue (the hallucinations) and a dramatic monologue presented as the hiker's self-shot video documentation of his ordeal. Even in that instance, the unreliability creeps in as captivity starts having a harmful effect on his perception, causing him to vocalize unusual scenarios as a coping mechanism. Boyle is not above cheating, occasionally presenting an important plot point from the third person omniscient point of view, like when Ralston leaves a sharp utility knife at home before leaving on his adventure. The viewer is allowed to see where it is, in a cupboard hidden from Ralston's view. But Ralston himself never sees it, foreshadowing the torturous, self-inflicted hacking off of his own arm with a dull pocket knife, a torturous act of survival he endures at the film's climax. At a very basic level, the softness of Love & Other Drugs, its uncompelling storyline, is attributable to the film's bifurcated plot. Ostensibly, it's a romantic dramedy about a sales rep (Jake Gyllenhaal), his adventures in the pharmaceutical trade, and his romance with an artist (Anne Hathaway) who suffers from early-stage Parkinson's Disease. Their romantic drama (and the attendant problems spiraling out of her affliction) wants to be the primary story. But the subplot of Gyllenhaal's rep's rise up the corporate ladder at Pfizer is far more engaging. This is likely because the movie is based on a book about pharmaceutical sales, the amusing Hard Sell: The Evolution of a Viagra Salesman by James Reidy. The disease storyline, as far as I know (I haven't actually read the book), was obviously sewn onto the book's plotline. This subplot suffers because it is told through the Gyllenhaal's character's limited viewpoint. Rarely do we experience the pain Hathaway's artist feels unless Gyllenhaal is in the scene. Here, the first person viewpoint actually detracts from the movie, unfortunate because Love & Other Drugs is still a better than average, romantic comedy/drama (honest in its unsanitized sexuality, too). Since Gyllenhaal is our way into the story, the perks of selling Viagra connect with us far more effectively because it connects with our lead directly. The plight of Hathaway's character does not. I haven't seen the third film you discuss, but I thought your evaluation of the first two to be quite apt. If only speaking about the issue of first person POV, I think '127 Hours' was the slightly more engaging film, although that might have to do with its more realistic story. Just spending time with the character in those dire moments shortly before he decides to hack his arm off were memorable to say the least.